Posted on March 9, 2017 March 27, 2018 by Heather W.
Are you a fashionista anxious to try the oh-so-trendy looks popular in fashion today? If so, it doesn’t take much effort to look the part. Distressed denim jeans can give you today’s cool and downtown look. Unfortunately, the ripped to shreds look costs a wad of cash nowadays. Well, it doesn’t have to. You can create your own distressed jeans by following one of these simple guides below. For more creative solutions, try a DIY ripped jeans tutorial from DIY Experience. You can either rip a pair of old jeans your already own or you can purchase a cheap pair at a local consignment or secondhand store. Already worn jeans will give you better results. For a more realistic look, the jeans you rip should be light or medium color jeans. Their light color creates a more distressed look. All you need is a pair of jeans and a sharp tool. To create holes, you will need a razor, scissors or a sharp knife. For the frayed look, you can use a cheese grater, sandpaper, pumice stone or steel wool. Lay the jeans you plan to put a hole in on a table. With a pencil or piece of chalk mark your jeans where you want to rip. You can use a ruler to mark the length of the tear. The knees of the jeans are where most people rip their jeans. However, your jeans can be torn anywhere on the pants’ leg. It is best to tear a little above the knee in order to avoid catching the hole and ripping it more. Be careful, not to put the rip too high. You don’t want your underwear to show. Insert a piece of wood, cutting board, magazines or book into the leg of the jeans where you will be cutting. You don’t want to cut the back of the jeans when you cut the front. Using a variety of tools, rub and thin out the spot you want to do the ripping. This will loosen the jean’s fibers making them easier to rip. You might want to try alternating the different tools. If you don’t want the frayed look, you can just go right ahead and cut. In order to create a hole, use a knife or scissors to yank at the weakened area. This will loosen the area’s fibers to allow a little skin to show when you wear the jeans. Do the same to both legs. Inside the distressed area, you can use your scissors to cut a small section. The tear should be only about a half-inch. You don’t want to make it too big and ruin your pants. For a more natural look, make your rip go across and not up and down. Rip the jeans at the spot where you put the hole and tug the threads around the hole a bit. This should create a look similar to natural rips. Do not cut the hole too much. Cutting the hole too much will create an unnatural edge to the fabric hole. If you just cut a small hole, you can get a more natural look by just wearing the jeans and allowing the tear to grow. By sewing around the tear’s perimeter, you can prevent the growing of the tear. You can sew the perimeter with either a blue or white thread using a sewing machine or by hand. Of course, if you want the tear to grow over time, you would skip this step. First, gather the things you will need, the old pair of jeans you want to use to experiment, scissors, tweezers, sandpaper and a pen, piece of chalk or marker. Put a pair of your old, faded and washed out pair of jeans on. Focus on the knees of the jeans. Draw a vertical line over each knee area. On one knee, cut one horizontal line. Using scissors, scrape along the edges of the cut. You can do the second knee differently. Cut 2 slits that are horizontally parallel. Using tweezers, pull out all the vertical threads between the two horizontal cuts. With this step, you simply select the pair of jeans to be ripped. Will it be your skinny or tight pair? Will it be your boyfriend style, blue, black or white pair? Begin by doing a few trial runs. You can use the old ones you don’t wear anymore, or cheap ones you got at the Salvation Army or Goodwill. Another approach might be to wash a pair in hot water with a small amount of bleach a few times to make them look extra worn. Using a pencil or piece of chalk draw a vertical rectangle on each side of the jeans. You should make the rectangles smaller than you actually want them to be so the marks you are making won’t show when you are finished. Lay the jeans flat on a table. Insert cardboard or piece of wood into each leg before cutting. The cardboard or wood will prevent your cutting the back side of the jeans. Use scissors or a knife to vertically scrape the area where you want the rips to be. Once you have frayed the area enough, you will see loose strings. Using a tweezer, fray the threads. If you want some skin to show when you are finished, use a crochet needle to pull the strings around the edges. You can have a more distressed look by pulling the vertical strings on either hole side. You can also tear them at the top, at the bottom and in the middle. 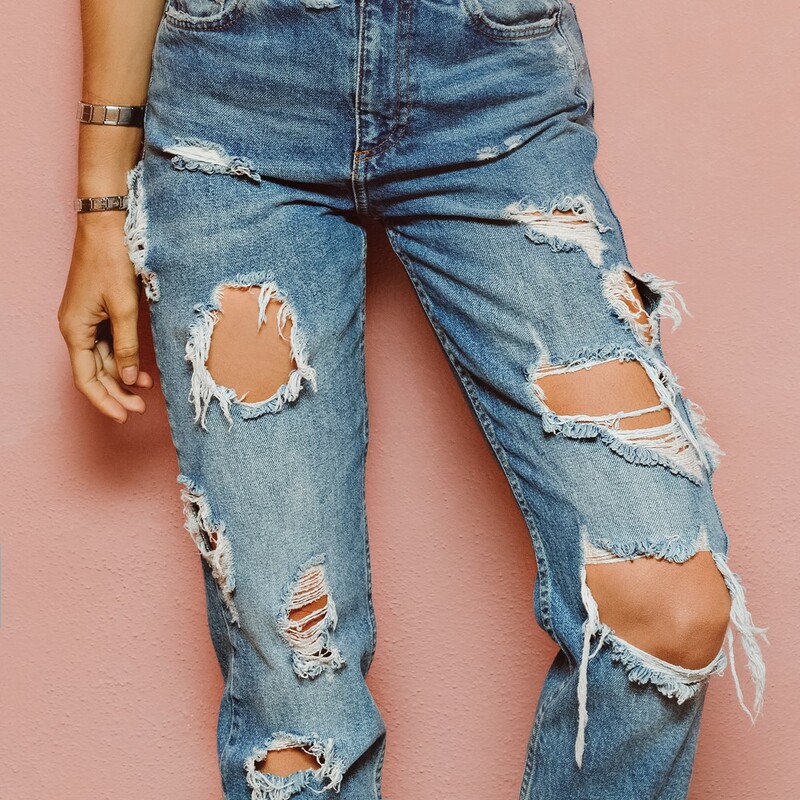 To make your ripped jeans, you will need: steel grater, coarse sandpaper, utility knife and cutting board of block of wood. Use a pair of old jeans. Wear the jeans and mark the areas you want ripped with the exact size and shape. Put the cutting board or block of wood into one leg to avoid cutting the back of the leg. Using a razor or scissor, make small cuts. Use sandpaper to fray the area where the cuts are. Pull out some threads to further give the old, ripped look.